You need face paint. Torn clothes. An old cell phone. And a mountain of lamb shawarma. As for the first three, you’re picking up last-minute supplies for a Zombie Jepsen costume. For a friend. And about that shawarma, well, you’re just really hungry and lamb shawarma sounds pretty good. Behold the Mediterranean splendor of Urban Garden, a quick, easy den of lamb, falafel and warm, pillowy pita bread from the owner of the Bowery and the Mercantile, now open on Fairfax. But usually you’ll just come here solo or with a bunch of friends, wearing whatever you’re wearing, when you don’t want fuss. 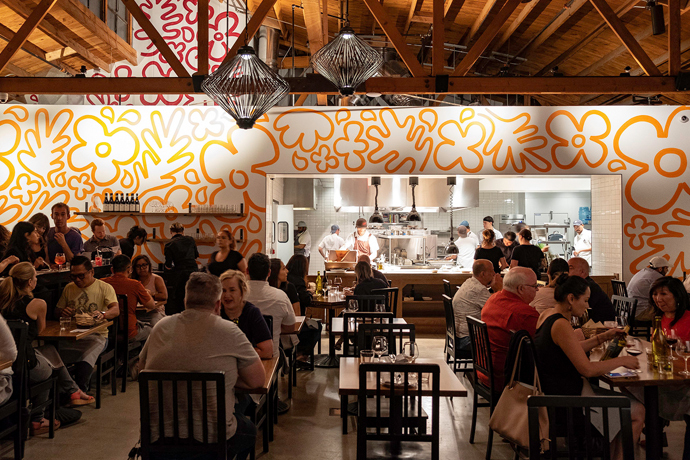 You just want to step up to a counter, summon piles of fresh pita, then maybe some chickpea and quinoa falafel or that lamb shawarma, carved from the vertical roaster whose contents you could smell from La Brea. Then plop down onto a wooden bench and down it all. Or if you happen to be on a date with a vegan, said vegan will have plenty of options here. Hey, more lamb for you.